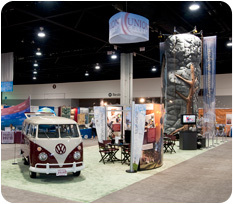 Customize Your Trade Show Booth Rental with Nomadic Display! To make a bigger impact with a smaller budget? A display that fulfills your design requirements without compromise? Freedom from multi-year contracts that don’t anticipate future marketing demands? To reallocate property savings to increase your promotional budget for events? To avoid the red tape required for a capital expenditure approval? The flexibility to meet the uncertainty of your future budget? A one-time presentation to keep pace with your rapidly changing business? If you answered yes to one or more of these questions then you should consider a custom trade show booth rental. Our custom trade show display rentals offer you the design impact of custom built AND cost efficiency. With a Nomadic trade show booth rental you eliminate all of the expenses associated with ownership including storage, maintenance, inventory management, repairs, refurbishment and disposal. We can provide everything you need from display rentals to graphics, transportation, I&D and storage. We ship your display to your show space and pick up from there afterward. It’s that simple! Save yourself time, money and stress, rent a Nomadic display for your next event. Browse hundreds of pre-priced rental display designs now. With the help of Nomadic Display and Vision Exhibits we were able to drive our existing campaigns and increase visibility with our target audience. Our custom exhibit was the perfect platform to engage with over 70,000 conference attendees from around the world. We are still hearing from key constituents on the quality of our booth and how it made a lasting impression on those who attended the General Conference Session 7th Day Adventists World General Sessions. Ryan Teller, Director of Public Relations, Union College.